The present volume introduces academic papers, speeches and presentations delivered at the conference held in the memory of the famous scholar, Orientalist, veteran of the Institute of Oriental Manuscripts of the Russian Academy of Sciences, Head of the Section of Central Asian Studies and the Department of Central Asian and South Asian Studies, deputy chair of the Russian Committee of Turkologists at the Russian Academy of Sciences, professor emeritus of a number of foreign universities, honorary member (academician) of the Turkish Linguistic Society, honorary member of the National Academy of Sciences of the Kyrgyz Republic, eminent Russian Turkologist — Sergey Grigoryevich Klyashtorny who made an invaluable contribution to the development of scholarship in the field of Central Asian history, as well as to collecting and studying of Old Turkic texts. The volume includes the works of more than twenty authors from Russia and abroad on the history of nomadic states of the ancient and early medieval period. The works of prominent Turkologists, colleagues and disciples of S. G. Klyashtorny, touch upon allied disciplines in history and philology. Many articles contain previously unpublished results of research in the history, ethnography and culture of Turkic and Mongolian ethnic groups. A number of sources are introduced for the first time. The volume will be of interest to Turkologists, historians, and all interested in the history of Central Asia. The article digests the outcomes of Sergey G. Klyashtorny’s study of the origins of the Khazar Turks in the t’ieh-le confederation of Turkic tribes, reported in Chinese sources under such title since the beginning of the 6th century C. E. The arguments in support of the hypothesis are discussed in the context of doubts and counter-arguments of the latest academic discourse on the matter. The evidence of Arab sources about the meaning of the name (nisba) al-Khazari is contemplated within the discussion of the subject. The data of the Arab sources and reports by Byzantine and Armenian authors are juxtaposed to highlight the earliest relations of the Khazars with the Barsils. New arguments in favor of Prof. Klyashtorny’s hypothesis are suggested. A large part of the scientific life of Sergey G. Klyashtorny was dedicated to archeo-epigraphic expedition. He worked beside such prominent scientists as A. N. Bernstam, M. I. Artamonov, M. P. Gryaznov, A. D. Grach, V. V. Volkov. He spent nineteen seasons as head of epigraphic detachment of the Soviet-Mongolian historical and cultural expedition of the Academy of Sciences of the USSR and the Academy of Sciences of the Mongolian People’s Republic, having traveled the country from East to West and from South to North. In this paper unique unreleased photos of S. G. Klyashtorny taken during his various expeditions in Mongolia are demonstrated for the first time. The article describes the scientific impact, made by S. G. Klyashtorny with his studies of interaction between literature and folklore. 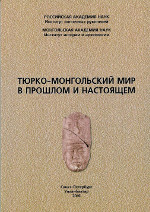 The reconstruction of the mythological pantheon of ancient Turkic runic inscriptions using historical works of neighboring peoples, done by S. G. Klyashtorny, is an important achievement in the process of understanding of the functioning of the subjects that were common both in written and oral literature. Many works of S. G. Klyashtorny are devoted to different aspects of the state and law of the Turkic peoples of Eurasia including sources (runic, epigraphic and even literary heritage), specifi c features of the state, social and political structure of the ancient Turkic states, legal regulation of land and property relations, and the status of specifi c social groups. Although the works of S. G. Klyashtorny are devoted mainly to the history of ancient Turks, many of his constructions and conclusions are very helpful to understand the specific features of the political and legal development of the later Turkic-Mongol states including the empire of Chinggis Khan and the states of his successors. No wonder that many specialists in the history of Turks and Mongols widely use the works of S. G. Klyashtorny in their research. The origin of the Turkic-speaking peoples of the early Middle Ages is an important topic of S. G. Klyashtorny’s works. He supported the monocentric concept, the followers of which believe that once there existed a "proto ethnos" of nearly all Turkic peoples named "ogurs". Th ose ogurs who migrated toward the west became Bulgarians and Khazars. The eastern ogurs under the name of "oguz" formed diff erent Uyghur tribes. Klyashtorny also considered the Middle East Oguz and Qipčaqs/Polovtsians as the descendants of the last. However, a considerable number of researchers follow the other concept — polycentric. Th is concept regards Western and Eastern Turkic peoples as two diff erent branches without any direct genetic link. Moreover, for the followers of the polycentric concept the validity of the key term "ogur" is in question. The article deals with the attempt to overview the research of some problems of the social history of the Türk Qaghanate of 6th–8th centuries and the Ancient Türkic period (6th–9th centuries) on the whole discussed in works of Sergey Grigoryevich Klyashtornyi. Particular attention is paid to the transformation of the Soviet/Russian researcher’s views on the features of the sociogenetic and politogenetic processes of the early nomads of Inner Asia. The Yenisei inscriptions are the common historical heritage of the Turkic languages. It is a valuable source for all Turkic languages, including the Kyrgyz language. These monuments, except for certain works, have not yet been investigated at the appropriate level in Kyrgyz linguistics, although some researchers have noted the similarity of the language of these monuments and the modern Kyrgyz language. Here the vocabulary of the Yenisei inscriptions and the modern Kyrgyz language are compared. The temporal order, as well as every grammatical category, has its own means of expression. The form of the indicative mood occupies a central position among such means in the Mongolian language. When considering the role of verbal means of expression in the presentation of the temporal order it is necessary to remember that these are the linguistic tools in combination and in conjunction with the order of the words, the circumstances and the sequence of the other, oft en non-finite verb forms that regard, as a rule, polypredicative designs. Thus, identifying the specifics of the temporal order is very important in terms of more accurate and detailed temporal characteristics of the complex as a whole. The subject of the article is the so-called Altaic theory, or to be exact —the theory of genetic relationship of Turkic, Mongolian, Tungus-Manchu, Korean and Japanese languages in its connection with related subjects: ethnography and archeology. The author marks the advanced achievements in the field of Altaistics as linguistics science, writes that areal problems of interrelations of the Altaic languages are not connected with the question of their affinity or common origin, shows that the criticism of the Altaic theory initiated in the recent years by some archeologists is unpersuasive, and house names in the Altaic languages confirm the Altaic theory from the linguistic point of view. The relevance of the research problem is due to the need to study the history of the development of Turkic studies in the modern world. This involves the consideration of the achievements of Russian and European Orientalists of the end of the 19th and the beginning of the 20th centuries. The purpose of this article is to give an overview of the Turkological legacy of academician A. Krymsky and to assess its contribution to the Russian and Ukrainian Oriental studies. The leading approach to the study of this problem is the problem-thematic approach, as well as the comparative historical principle. The main result of the research is the systematic description of the scholar’s works on Turkology. The article focuses on the variety of materials written during his work at the Lazarev Institute of Oriental languages and at the Ukrainian Academy of Sciences, and identifies the main research areas of his Turkological studies. The article substantiates the proposition that the writing of the Turkish Bulgarian ethnos Hons of Northeast Caucasus and Daghestan was the earliest among the Turkic peoples in the conditions when the first proper (Eastern) Turkic-speaking runic monuments date back to the 6th century at the earliest. The Hon people themselves are one of the components on which later formed the Kumyk people of this area. In the article a wide range of both historical and linguistic sources is used. In the article a hypothesis is presented about the origin of the name of the Mongolian empire’s capital — Karakorum. It is assumed that Karakorum might have been named after the headquarter of Uyghur Eletmish Bilge-khagan (747–759), which was located in the middle of sacred Uyghur ancestral homeland close to the extinct volcano Khorgo. The author describes the collection of finds from Khara-Balgasun. These findings are kept in the Oriental Department of the State Hermitage Museum, they have not been described or published. The fi ndings represent surface material, they were discovered by the expedition of V. Kotvich in August 1912. Most of the artifacts are related to the 8th–9th centuries, the Uighur time. The article is devoted to the views of early Eurasians on the role of the steppe, the Turkic and Mongolian peoples in the history of Russia. In particular, the Eurasians, on the basis of the values of nomads in the history of our country, offer their own periodization of Russian history. The article gives a new interpretation of the terms otuz-tatar and toquz-tatar of the old Turkic and Uyghur runic inscriptions, in which the figures otuz (thirty) and toquz (nine) have so far been interpreted as indicators of numerical composition of the Tatars and translated respectively as “thirty tribes of the Tatars” and “nine tribes of the Tatars”. Based on the analysis of accounts of Turkic and Chinese sources on the ancient Tatars the author reconstructs the historical context of the use of those terms and connects the notions otuz-tatar and toquz-tatar with tribal structures of the Turkic and Uyghur Khanates that consisted respectively of thirty (otuz) tribes of Turks and Oghuzs and nine tribes of Oghuzs (toquz-oghuz). The "Yenisei sufferings" are associated primarily with the undated Yenisei runic monuments (as a whole and in specific groups) and the sharp disagreement generated by this fact among experts on the problems of dating. Most of the Yenisei inscriptions now, in contrast to the initial phase of their study in the days of W. Radloff , are recognized as related to the second half of the 9th-10th centuries. The paper proposes a method of relying on the external data of the inscriptions that are not related to historical reasoning that cannot provide decisive and demonstrative evidence, namely, on the paleographic characteristics of the writing. The article deals with the theoretical basis and practical calculations of the paleographic approach on the example of a group of monuments in Khakassia — E-28, E-29, E-30, E-37. It presents the arguments of S. G. Klyashtornyi who proposed the hypothesis of the relatedness of this group of inscriptions to the middle of the VIIIcentury, and the counter-arguments of those who do not agree with such an early dating of these monuments, including our paleographic arguments. The Yenisei runiform alphabet was an official font of the Medieval Khakas state. The epitaph found in 2007 is important and still unique material evidence of the presence of carriers of these characters near Beshbalyk. The paleographic definition of a new runic monument indicates the involvement of soldiers of the autochthonic population of the Tuva Depression in the distant military campaigns of the 9th–10th centuries. In scientific literature there is no consensus still about the origin of the title Kyrgyz-azho, the ancient Yeniseian Kyrgyz state rulers. In this article, in the light of new information sources, was made an attempt to find a new interpretation of the meaning of the term and its evolution which can be traced in the political tradition of the Altai and Tian Shan Kyrgyz, who used the terms in the late Middle Ages. The simultaneous usage of the terms inal and idi at the beginning of the 13th century shows them as political nomenclature in the titles of the Altai-Yeniseian Kyrgyz. It also shows the vulnerability of the arguments of those researchers who assume the identity of the terms inal and azhe /idi. The fragments of Old Uyghur manuscripts discovered between 1902 and 1914 by the four German Turfan expeditions in the Turfan oasis are among the oldest written sources of the Turkish languages. Only the inscriptions in Old Turkic Runic script are older. They date from the end of the 7th century. Among the more than 40,000 fragments of manuscripts and block prints preserved in the Berlin Turfan collection there are more than 8,000 items in the Old Uyghur language. Th is paper shows the great variety of content of these fragments and presents their importance as the main source of information concerning the social and economic life of the Old Uyghurs in the West Uyghur Kingdom (from around the 9th to the 12th cc.) and under the Mongol rule (from around the 13th to the 14th cc.) and their religions, i. e. Manichaeism, Church of the East and, above all, Buddhism. In this article the author considers the reasons of the beginning of Mongol-Khwarezmian war (1219–1221) as given by medieval Arab-Persian authors. These reasons are analyzed in detail, the author accentuates those of them which the Arab-Persian historians considered the main, and those that one can recognize as minor. Besides, the author specifies the debatable moments: in particular, the “Otrar incident” and the presumable embassy of the Caliph an-Nasir to Mongols are analyzed in detail. Th is article addresses the problem of the origin and localization of the "Manutokhai" toponym. The Manutokhai tract is known as a place in the Volga-Akhtuba floodplain, where in the 17th–18th centuries the residence of Kalmyk khans was located. As a toponym "Manutokhai" probably means geographical peculiarities of terrain, “a place where an overgrown with bushes river’s bend is located”. Manutokhai was situated on the territory from the beginning of the river Akhtuba to the bank of the river Volga near the village Chiorny Iar, near a sand ford, probably in the vicinity of the present village Kiliakovka in the Volgograd region, where the river Akhtuba makes a sharp bend. On April 8-10, 2019, the 41st annual session of St. Petersburg Arabists will be held in the IOM RAS.